In the first week of March, musher’s will gather for one of the world’s longest and most grueling sled dog races—the Iditarod—from Anchorage to Nome, Alaska. How does one prepare for a race of over 1,000 miles of frozen trail in temperatures well below freezing? Egil Ellis on a training run in Willow, Alaska. Photo by Helen Lundberg. Preparations start the previous spring, but by December the dog teams are covering between 25 and 75 miles a day, four or five times a week. 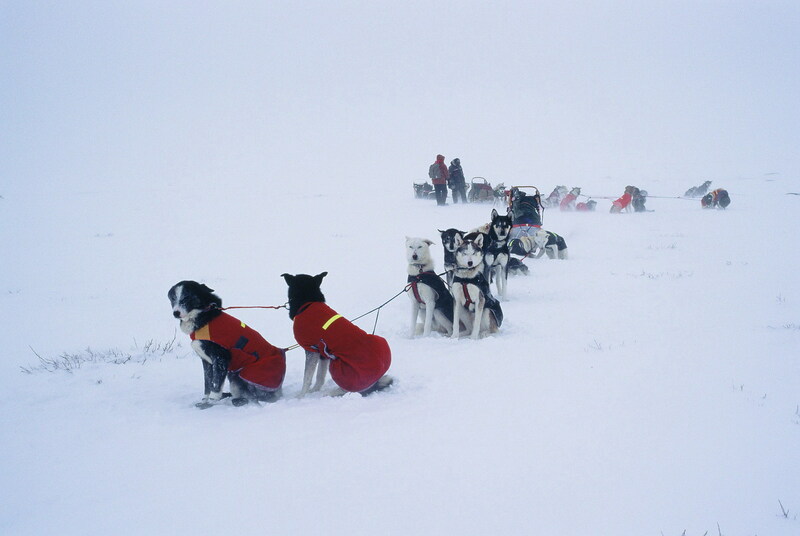 During these runs the musher is constantly evaluating each dog’s performance. 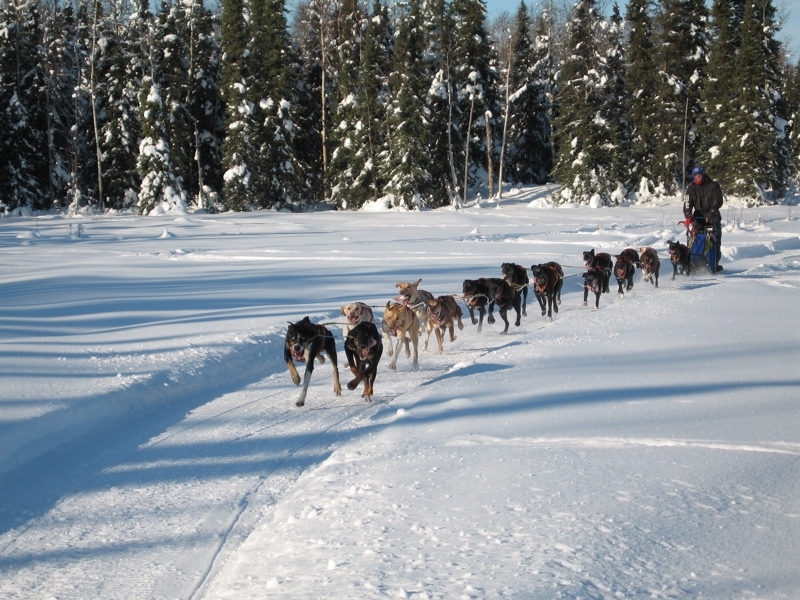 Mushers attempt to pair dogs carefully by size, conformation, build, gait and attitude to achieve synchrony of pace (dogs that match each other’s stride). “When dogs run in synchrony they all move gracefully together. No individual stands out by running differently,” say Miki and Julie Collins. unison. Photo by Helen Lundberg. Rigging and sled handling also affect rhythm. “Fast or tall dogs will need longer sections of gangline,” according to the Collins’s. You will discourage rhythm if you cannot control your sled or if the sled does not track nicely. Skilled, matched dogs can speed up or slow down without losing rhythm, and switch leads in synchrony on a corner. However, unconditioned dogs can unbalance the whole team. Young dogs need time to learn this. By observing the dogs’ ears, heads, and tails, the musher learns to recognize when they are tired, when they are slacking off, and when they are under too much pressure. Serious competitors make special training excursions to parts of Alaska that have a significantly different climate from where they regularly train. Susan Butcher used to run her dogs along the Bering Sea coast each February in order to prepare her team for the renowned coastal blizzards. Racing teams must be accustomed to all types of conditions. Here a team crosses open water. Photo by Collins. In January and February, mushers compete in other mid- to long-distance races. By now they have all completed several thousand miles of training runs. According to Susan Butcher, a winning dog is made, not born. “It isn’t magic. It’s just work and work and work and work,” she was quoted as saying. That work includes attention to the dogs’ mental and physical health, as well as careful conditioning. 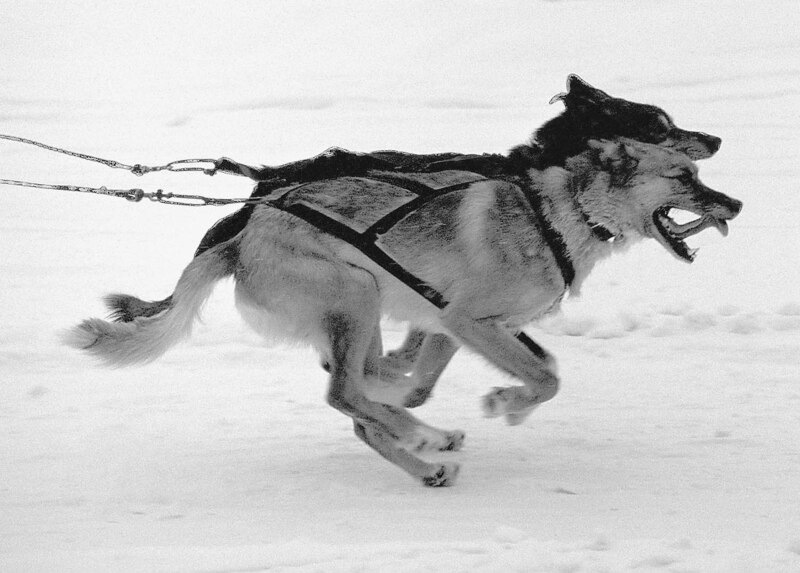 According to Mary Hood in her book A Fans Guide to the Iditarod, “a competitive dog will be able to trot at ten miles per hour, lope at fourteen miles per hour, and maintain an average speed of eleven miles per hour over the nearly 1,200 miles of the Iditarod.” In 1989 Road & Track tested one of Joe Runyan’s teams. The dogs accelerated from zero to twenty-five miles per hour in 6.3 seconds, and reached a top speed of 28 mph. By the time the team has run enough miles to condition them properly for the Iditarod, there is a real chance they will burn out, or go sour. The Collins’s suggest giving the dog a few days off work, playing with him, and giving him lots of praise. If the whole team is tired, sometimes running them on a totally new trail will help. Letting the dogs rest for longer periods than they want or stopping before they need to rest may soon have them screaming to go out of pure contrariness. In early winter, mushers begin accumulating the food and equipment that will be shipped ahead to each checkpoint of the race. 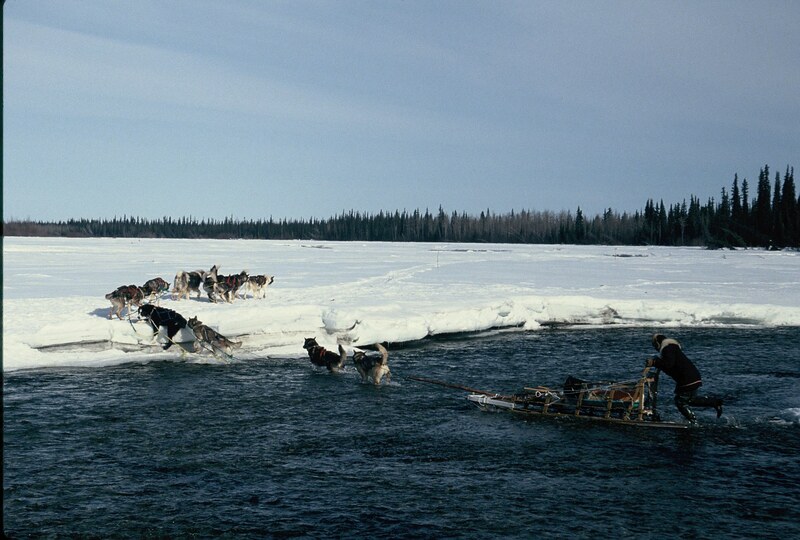 Each musher ships a total of about 3,000 pounds of food and supplies. All of this comes at a price. Estimates of the cost for a musher to enter a team in the Iditarod range upwards of $50,000 for a winning team. In order to pay for this, most mushers solicit sponsors. It is probably the musher’s least favorite job. “You can end up feeling like you’re selling your soul for money,” cited one competitor. Clothing is not a small expense. Smart mushers prepare for almost any weather condition on the trail. At -20 degrees F., which is most musher’s favorite temperature to run dogs, a forty mile an hour wind will create a windchill factor of –87 degrees. Warm weather is another problem. Dogs overheat and mushers must slow their teams and give them extra rest in such circumstances. Rain is perhaps the most dangerous weather because it saps both driver and dogs of heat and energy and soaks clothing and gear. Both dogs and drivers must be prepared for all types of weather. Here two teams take a break during a blizzard. There are still a few copies of Mary Hood’s book A Fan’s Guide to the Iditarod around, and it is filled with informative and interesting facts for anyone who wants to learn about the Iditarod. For those who want to learn more about what it takes to train and prepare a dog team for long distance racing, I highly recommend Dog Driver: A Guide for the Serious Musher by Miki and Julie Collins. This entry was posted in sled dogs and tagged avoiding sled dog burnout in racing teams, clothing for Iditarod race drivers, conditioning racing sled dog, dog sled racing, equipment and food needed for Iditarod, how to prepare for Iditarod, Iditarod, Iditarod Sled Dog Race, Julie Collins, preparing dogs for Iditarod race, preparing for the Iditarod, Racing Alaskan Sled Dogs, sled dog burnout, sled dog race preparations, sled dog racers, sled dog racing, sled dog snychony, sled dogs, sled racers prepare for Iditarod, The Iditarod. Bookmark the permalink.